Your Day Hike with Desert DAWN will take you to some of our favorite locations. To enjoy your hike to the fullest we have assembled this list of items to bring. It is good to bring the items on the list with you on your vacation to Boulder, Utah, then on the day of the hike you may determine if the item is needed or not. We want your time here to be worry free, so please let us know if you have any questions (see the bottom of this page for contact information). We look forward to spending time with you on the trail. Let’s Hike, Explore, Discover! Download Desert DAWN’s Recommended Clothing and Gear List of items to bring to Boulder in order to be prepared for the array of weather you may encounter. A note from Desert Dwellers: Please have plenty of water and good sun protection. Plenty of water, wide brimmed hats and loose long sleeve shirts and long pants are the standard for most desert dwellers. Following is a brief description of some of the items on the Recommended Clothing and Gear list. Hat with brim – Desert dwellers know that a wide brimmed hat is an important article of clothing when venturing into the sunshine. A cotton of straw hat with a 3″ brim will work quite well. Sweater or light jacket – Bring one with you just in case the weather turns cool on us. The weather in the desert is typically hot in the summer, however because we hike at elevations over 5000′ it is possible to have intermittent cold days. Rain jacket – Rain is possible throughout the year, however our rainy season is typically mid July through mid September. Comfortable hiking shoes – Light weight hiking shoes work well for most hikers in this terrain. Of course, wear what you typically wear. The important thing is to have shoes that are broken in for your feet and you are used to wearing. If you are participating in a riparian canyon hike, partcularly on the Escalante River you may also want to bring sandals or water shoes. Daypack – A day pack large enough to fit the items to be carried with you. 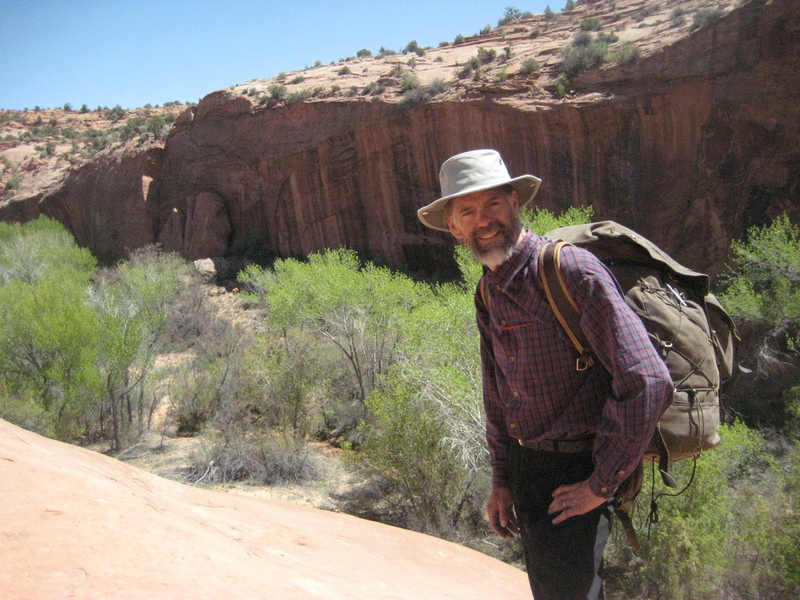 Water (2 -3 Liters) – For most Desert DAWN Day Hikes, two liters of water is adequate. If you are planning a hike in the middle of the summer three liters may be necessary. You will be advised of this when you reserve your hike. Lunch or snack – Our hikes generally have a break in the middle of the day for lunch. Most guest find that a sandwich with fruit and a snack bar is adequate to sustain their energy. In Boulder, Hells Backbone Grill provides a box lunch for hikers and Hills and Hollows has a variety of items that are excellent trail foods. Camera – You will certainly want to remember the spectacular scenery. You will want to protect you camera from the sand in the desert. Most digital cameras will fit into a quart sized Ziploc. Binoculars – we will not always be able to get close to things we may want to see. Some rock art requires binoculars to see. Some birds are best seen with binoculars. When looked at through through the opposite end, binoculars also work as a microscope to view the intricate details of flowers or insects. Sunscreen – The sun at our elevation can be quite strong. If you are sensitive to the sun remember bring the sunscreen that works best for you. Insect repellant – Insects at some times of the year can be quite bothersome. Lightweight long sleeve shirts and long pants will protect you from most insects. Insect repellant may be helpful for the hands and face. Hiking the canyons in January is quite frequently an amazing experience. 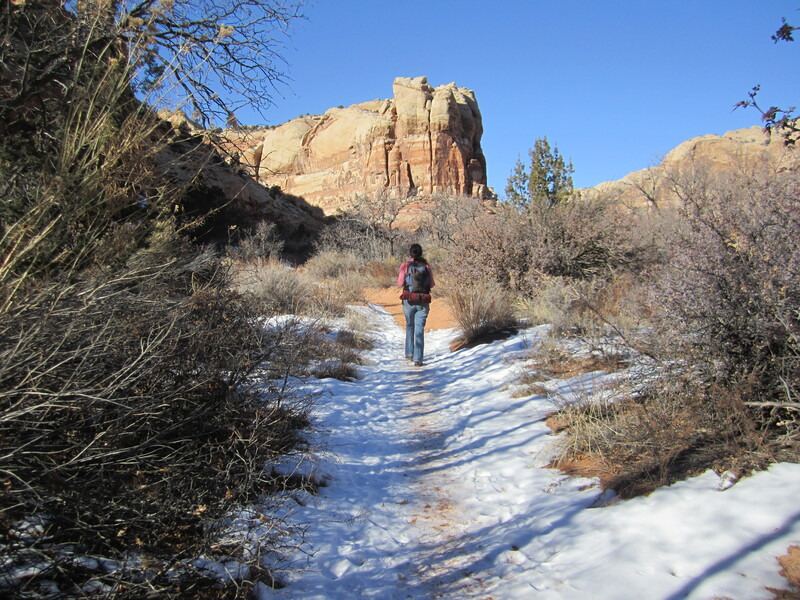 Hiking the riparian canyons and high desert of South Central Utah can be quite pleasant during the colder seasons. Even in January the temperatures can be in the 40s or 50s. It is necessary during these times to be ready with extra clothing. Wool hat – a wool beanie or watch cap easily slips over a baseball cap to keep the head warm. Baseball cap – A baseball cap will help with bright sun on the face and eyes and will allow your wool beanie to slip on to to keep the ears warm. Neck warmer – A silk kerchief makes an excellent neck warmer. A size approximating 44″ x 44″ is large enough to wrap several times around the neck. Warm jacket – the jacket should not be so bulky that it will be a burden to carry. Remember that layering is the way to go, so a lighter jacket with a warm shirt and a sweater should provide you with quite a bit of insulation. Gloves – A pair of medium weight gloves may make a big difference. Gloves that are water proof or water resistant are preferred. Wool socks – Cotton socks that may work well for you in the summer may cause you to have very cold feet in the winter. Socks that wick moisture away from the feet are critical in colder weather hiking.